This is my first Jihva entry for Chillies. JFI or Jihva for Ingredients is Indira's brainchild and each month our avid food blogger community and other food lovers join to celebrate one Indian ingredient. This event of JFI-Chillies is hosted by Nandita of Saffron Trail. 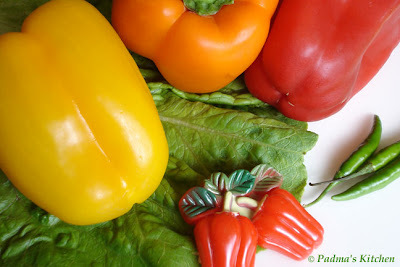 I am using bell peppers which is also a chilli and hope this will qualify my entry. I am voracious spicy-food eater and that's the reason you will find use of green chillies and chilli/cayenne/mirchi powder frequently in my recipes. So I please please recommend you to adjust the spice level according to you if you are trying my recipe. I always emphasis on this coz you might not end up with very hot air coming out of your ears ))>>>(oo)<<<(( Today's dinner menu is Lettuce Cherry tomatoes and Orange salad with honey-mustard-lime juice dressing, Spaghetti with roasted peppers, basil and dessert cups with strawberry preserve, whipped cream and cherry topping for dessert. Hope you all will enjoy as much as I did while cooking, yet to eat and this is a surprise dinner for my DH (darling hubby). 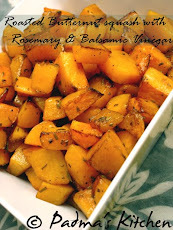 I am posting individually for each recipe, scroll down...... I am sorry that I had to repost this due to some technical problem with my earlier posts. This is the comment form Shanti of http://mykitchenhobbies.blogspot.com/ I had to repost this topic as I had some technical problem with my earlier posts that is why I am reposting her comment. 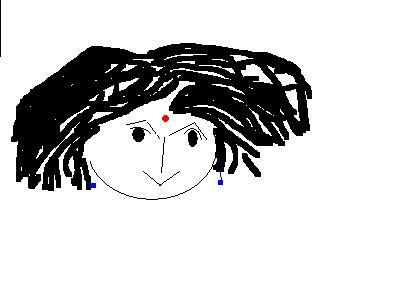 Shanti:hi padma..this is shanti(TIA) mee blog chala chala bagundhi pictures r too good chala clear ga baga vachayi...nice work.mee blog na blog lo add chesukuntunna..
padma...the dishes are looking yummy...excellent pictures..
Hi Padma! looks colorful and fantastic. Great entry. Thanks for sharing. are there any leftovers? i wanna come over. @ Shanti, thanks for your wonderful comments. @ Coffee, Yeah we had a great time eating it too! It was a big big surprise to my DH. @ Wokandspoon, me too have the same problem, my DH sometimes complains about the spicy-i-ness in the food. @ Asha, thanks for your kind comments! @ Jyothi, thanx for dropping by...you have a great blog. @ Athika, that was one kinda dinner we had yesterday. Thanks for your kind comments. 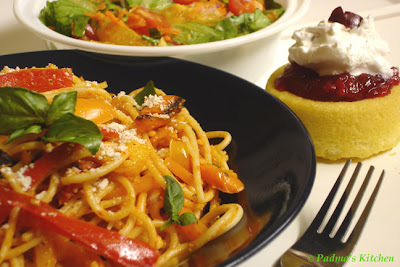 @ Bee, I am sorry that you were late in announcing, my DH already finished the leftover spaghetti today morning, Sorry!! You really made my tummy growl for food! What amamzing pictures and recipes you have pen down. Really great! And... it seems to me you have done some professional cookery course. Neat! Keep us posted!! that looks so good padma, its awesome! Hi Padma! Thanks for dropping at my blog and for your lovely comments. I added your blog name in my foodie's list. Padma, I want a favour from you, if you don't mind. The header image of your blog is very very beautiful. Like that I want to prepare for my blog too. Can you tell me how to prepare that image? when you are free, then only tell me. Thanks in advance. Beautiful pics Padma. Pasta is just right. Not mushed up, quite inviting. Thanks for dropping by such a lovely comment on my blog :). You have done a great job by starting this blog about cookery and seems its quite a hit!! Congratulations, I must admit you have come a long way in these couple of years. Your pictures are really good! I've added you to my blog roll. Padma, very beautiful presentation buddy. I love the way you incorporated all the colors.